The Ultimate Guide- How To Rekey a Lock? Instead of changing out your locks every time you need to make a change, knowing how to rekey a lock can save you a lot of time and cash. You don’t even need to call a locksmith to get this job done. With a rekeying kit, which is available at most major retailers, you can get this job done in as few as 5 minutes for under $20 per lock. This works for deadbolts as well. Here’s what you’re going to need to do to get this job done right the first time around. Make sure you pick up your rekeying kit before beginning. Each kit will typically rekey up to 6 locks for you. There’s a clip which holds the actual doorknob in place. If you look closely at the knob itself, there should be a small hole where you can insert a wire to trip this clip so you can remove the lock face that needs to be rekeyed. Many kits offer you a piece of wire to accomplish this step, but an unbent paper clip can do the job too. This item will usually have 5 pins associated with it. 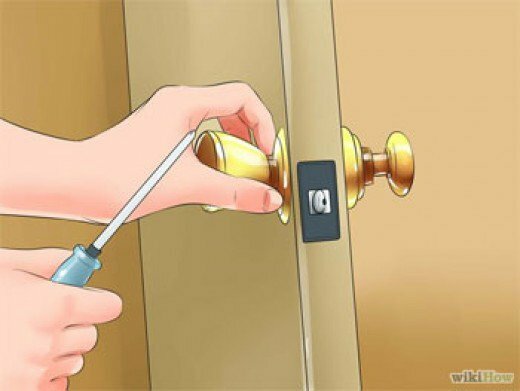 You’ll need to push or lift the lock cylinder out of the door mechanism carefully so that it isn’t damaged. Once it is out of the knob, you will then need to remove the retainer ring of the cylinder so that you can access the pins. Be careful when removing the retaining ring because you will need it later. It can bend when pushing it off. Lock pins typically have pointed ends that will touch the key as it is inserted into the lock. They are of varying lengths, which means only a key that matches the pins can open the lock. You’re now at the point where you need to remove these pins. The bottom pins will typically just fall out. Once the old pins have been removed, you’re ready to insert the new lock pins. Make sure you insert your new key into the cylinder plug before inserting the new pins. You’ll know that you’ve done this step correctly because all pins must be flush with the top of the plug. If they are not, then you have inserted the lock pins in the wrong order and must repeat this step. Now you’re ready to reverse the process. Insert the cylinder plug back into the lock cylinder with the new key still inside the plug. Use the 45 degree angle for proper placement and use consistent pressure. Turn the key upright, put the retaining ring back on the cylinder, and then align the knob with the cylinder. Then you just need to place the doorknob back into place, making sure it clips back onto the cylinder as before. That’s really all it takes to rekey a lock. Most rekeying kits will have all the tools you need to engage the clip, remove the retaining ring, and push out the cylinder plug. Remember to use consistent pressure when removing or installing the plug at this key step and you’ll have a successful rekeying experience for a fraction of the price of a new lock.